While there is no cornflake diet, ready-to-eat cereal works as a convenient meal option for those trying to lose weight, and it can work as a diet-friendly meal in place of higher-calorie options. If you're thinking of trying cornflakes to help you on your weight-loss diet, consult your doctor or a dietitian to help you design a healthy diet plan that works with the cereal. 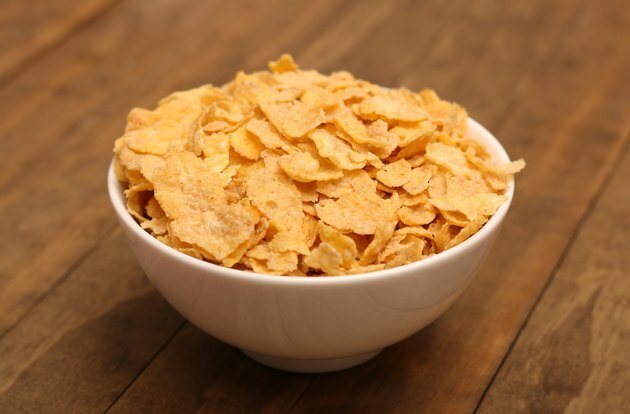 Like many types of flake cereal, cornflakes are fairly low in calories. A 1-cup serving has 100 calories, 24 grams of carbs, 1 gram of fiber and 2 grams of protein. Cornflakes are a fortified food, so they're also a source of vitamins and minerals, including several B-complex vitamins. The cereal is also low in sugar, with only 3 grams per serving, which is equivalent to about 1 teaspoon of sugar. The key to weight loss is creating a calorie deficit, which means you're taking in fewer calories than your body needs. Replacing a meal or two with a bowl of cornflakes may help you create the needed deficit. For example, replacing a large bagel and 2 tablespoons of cream cheese with a serving of cornflakes with nonfat milk saves you roughly 250 calories. If you made that swap every day, you'd save enough calories to lose 1/2 pound a week. When used as a meal replacement, cereal can help you lose weight, according to a 2002 study published in the Journal of the American College of Nutrition. This study compared the effects of replacing lunch or dinner with a portioned amount of ready-to-eat cereal -- a 100-calorie portion of cereal with 2/3 cup of skim milk and fruit -- on weight loss in a group of overweight people. Over the two-week study period, the participants ate about 600 fewer calories a day and lost about 4 pounds. The researchers in the study used a variety of different cereals. Although short in length, this study showed that replacing your usual lunch or dinner meal with a bowl of cereal helped decrease overall calorie intake, leading to weight loss. Additionally, the type of cereal consumed didn't seem to matter. Other more recent studies have shown similar weight-loss results. The researchers of a 2007 study published in the International Journal of Food Science noted that the dieters were also compliant with the meal-replacement plan. Keep calories in check on your cornflakes diet by controlling portions and being mindful of your milk choices and toppings. A healthy cereal portion for weight loss might include 1 cup of cornflakes with 1 cup of skim milk and one serving of fruit, which might be equivalent to a small banana or 1 cup of sliced strawberries. This bowl of cereal has 230 to 270 calories. But when it comes to weight loss, you need to consider more than just your bowl of cereal. What you eat at the other two meals also counts, as well as any snacks. While weight-loss calories vary depending on your gender, age and exercise, women typically lose limiting their overall intake to 1,200 to 1,500 calories a day, and men and more active women lose by limiting their intake to 1,500 to 1,800 calories a day. Filling your other meals with nutrient-rich low-calorie foods -- such as fruits, vegetables, whole grains, lean proteins and low-fat dairy -- is also necessary to keep calories under control and ensure you get all the nutrients your body needs for overall good health. While it doesn't seem to matter what cereal you eat to help you lose the weight, not all cereals are equal. In fact, cornflakes may not make the healthiest choice. A healthy cereal for any diet should contain whole grains, 5 grams or more of fiber and less than 8 grams of sugar per serving, according to the University of California at Berkeley. Cornflakes are low in sugar but not a good source of whole grains or fiber. When it comes to weight loss, fiber helps by keeping you full so you eat less. You can add extra fiber with fruit; 1 cup of sliced strawberries has 3 grams of fiber. Using a high-fiber cereal, such as wheat-bran flake cereal, adds another 5 grams.